Through a series of critically acclaimed releases over the past decade, saxophonist and composer Rudresh Mahanthappa has explored the music of his South Indian heritage and translated it through the vocabulary of his own distinctive approach to modern jazz. On his latest release Bird Calls, available February 10, 2015 on ACT, Mahanthappa trains his anthropological imagination on an equally important cultural influence: the music of Charlie Parker. 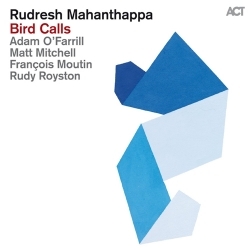 With a stellar quintet of forward-thinking musicians, which includes some long-time collaborators as well as 20-year-old trumpet prodigy Adam O’Farrill, Mahanthappa offers an inspired examination of Bird’s foundational influence and how it manifests itself in a decidedly 21st-century context. “It’s easy to say that Bird influenced modern music without dissecting that notion,” Mahanthappa says. “If I had any agenda for this album, it was to really demonstrate that. Though it pays homage to one of jazz’s Founding Fathers and arrives at the outset of Charlie Parker’s 95th birthday year, Bird Calls is not a tribute album in the traditional sense. There isn’t a single Parker composition to be found on the album, which consists entirely of new music penned by Mahanthappa for the occasion. But Bird’s DNA is strongly present in every one of these pieces, each of which takes a particular Parker melody or solo as its source of inspiration. Each is then wholly reimagined and recontextualized by Mahanthappa and his quintet which, in addition to O’Farrill (son of pianist and Afro Latin Jazz Alliance founder Arturo O’Farrill), features pianist Matt Mitchell (Dave Douglas, Tim Berne), bassist François Moutin (Jean-Michel Pilc, Martial Solal), and drummer Rudy Royston (Bill Frisell, Dave Douglas).